Valentine's day menu ... the fondue! Mix the flour with 1 teaspoon of oil, 1/2 teaspoon salt and water (lukewarm) in which you have thoroughly dissolved saffron; knead until the dough becomes smooth and compact. Let rest for 30 minutes in the refrigerator covered with a damp cloth. At this point pull the dough with a rolling-pin up to a thickness of 2 mm (if you have, use the pasta machine); with a cookie cutter, cut into hearts and arrange them, as, on a cloth sprinkled with semolina. Let air dry for 30 minutes. Wash the leek and discard the outer leaves; cut slightly oblique washers and put them aside, separating the whites from the green one. 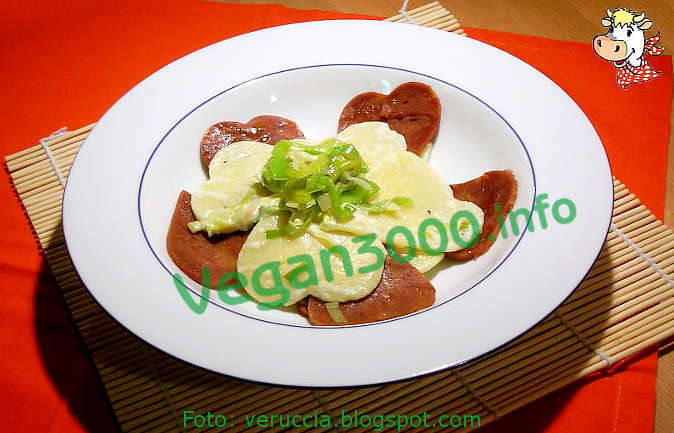 Cut hearts from vegan ham, saute in a skillet with 1 tablespoon of hot oil, add the leek (before the green part, after 2 minutes the white one) and let it wither with a pinch of salt, blending with brandy poured little by little. Remove from the pan and keep aside, hearts, warm; add the leeks and cream and turn off after 1 minute. Try to ensure that the pasta and leeks are cooked at once, putting to wilt the vegetables as soon as you begin to cook the pasta. Once cooked, drain and put in the pan for 1 minute with the cream and Leek. Place in serving dishes pasta place sliced, those hearts, forming a flower or another decoration; sprinkle with freshly ground pepper, decorated with a few pieces of leek (cooked) and serve! You can also make different shapes of pasta, and replace the vegan ham with smoked tofu or seitan from dice, if they found more easily.